Early next month, Tova will launch Ambre D'Oro, a fragrance inspired by the "bold, romantic culture and luscious vegetation of Italy" and incorporating notes indigenous to the area. The musky floral was developed by perfumer Victor Rouchou, and features notes of lemon, plum blossom, peony, lily, jasmine, mimosa, iris, gladiola, heliotrope, sandalwood, patchouli and amber musk. Ambre D'Oro is designed to be essentially linear. Indulge in the finest most luxurious version of Pink Sugar yet. It is the pure essential oil that makes up your favorite perfume, and is encased in an elegant glass bottle. 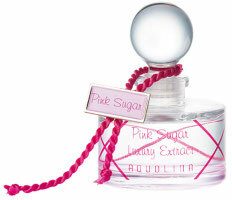 Aquolina Pink Sugar Luxury Extract is available in 15 ml for $95, and can be pre-ordered now at Nordstrom. Stronger than the original one? O.o This will surely atract bees. Yeah, I think we can all agree that the only thing wrong with Pink Sugar was that it just wasn't strong or concentrated enough. Girls wearing it had a visible halo of the stuff around them, but it wasn't visible from outer space. I'm glad to see Aquolina is correcting this oversight. Please, don't hate to admit it! We should all be free to like or dislike whatever we want, and never take offense at other people's kvetching. I have my own candy favorites. I could see someone liking that Ambre D'Oro bottle. I have never smelt Pink Sugar, though now I want to just for fun. However, I'm pretty sure “Pink Sugar Luxury Extract” is an oxymoron, no? And it's the “pure essential oil” squeeeeeeeeezed drop by drop from a mountain of genuine pink sugar — takes one ton to produce a half-ounce of the precious oil, right? LOL — just picturing that mountain of genuine pink sugar. HA. Tova Ambre D'Oro looks good in that bottle! sounds really nice. P…pink… sugar…. extract…. that will kill an elephant! First of all how many times did I say it this year, even low class perfume brands HAVE to go friggin luxe… Gosh, why, why, why? Plus Pink Sugar, oh god this stuff was terribly terrible…. (sorry fans) And I do have a sweet tooth and still think it was terrible. Well…MOI…with all his fancy shmancy niche smiche bottles….just happens to own a bottle of BLUE SUGAR! THERE! I admitted it! AND to go one step further….even LIKES the scent of the girls at work who wear pink sugar! Might have to try that Tova – I like the bottle, and I liked Tova Night enough to give this one a try. You know, I have never bothered to even smell Pink Sugar. I think I may have to to see what all the fuss is about. Sometimes I do like some candy, so you never know. I know I was all snarky and everything up there, but I don't hate Pink Sugar. It's actually kind of pretty, and it's more complex than you'd think if you'd only read about it. But it's just so STRONG, and it's aimed at a cohort that, let's face it, doesn't really know much about discretion when applying a scent. A few drops of Pink Sugar are one thing, but three or four sprays are something else entirely: the idea of a stronger version of it is a little scary. Luckily, this new version is out of the teenage price range, so it's clearly aimed at adult women who wear it and (we can hope) dab it on with a modicum of restraint. It's true, everyone is going luxe. Although $95 isn't all that bad for extrait…still, comical when you consider that you can get the same amount of Diorissimo extrait for $125. The EdT is pretty strong, not sure I see why the need for this. A lighter summer version would seem to make more sense. I like Blue Sugar better than Pink Sugar. But liked Chocolovers better than either. Never hurts to try. It has a burnt smell on me, and not in a pleasant sort of “toasted” way — but many, many people love it. I will go one step better and admit that I actually own pink Sugar, Blue Sugar and Chocolovers! I have to admit, I mostly own them for the gimmick factor but there are times that they are fun to wear. Funnily enough, men compliment me when I wear Pink Sugar but nobody seems to notice when I wear my favourite spicy inscense frags. NO TASTE, I say!